Close to Victoria Park Lake. At 16.5 squares of living this brick veneer 3 bedroom home offers a good sized first home or investment opportunity. Currently leased to August 2018 @ $300 per week. All generous sized bedrooms have built-in robes, bathroom includes bath, separate shower & vanity. 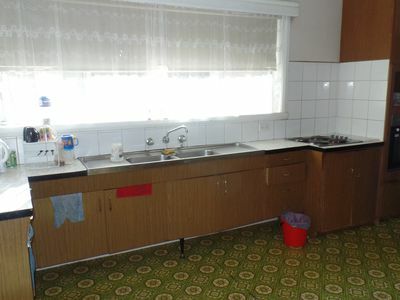 Kitchen is a good size with “eat-in” meals space. There are 2 Separate living spaces and a large double garage with 2 x tilt doors. Corner location on 602sqm land. Reverse cycle split system air conditioner. Large Garage with 2 x tilt doors, lights & power. Small Outdoor area at back door. Currently leased at $300 per week.